The greatest honor in these 10 years of my Agile life was the Gordon Pask Award I received at Agile2008, but the first Agile conference I attended was Agile Development Conference 2003 in Salt Lake City and I received my first memorable award there -- Thank-you-very-much-for-coming-all-the-way-from-Japan award. So I’m glad to write as a GPA recipient here, about uniqueness of Agile movement so far and now happening in Japan. Currently Agile is accepted widely worldwide, but acceptance ratio in Japan is still I guess less than 20%. But it is increasing, rapidly increasing over the last 2 years. In Japan’s software industry (I’m talking about enterprise systems mainly, not the embedded systems industry here), Users and Developers are usually separated into two sides by contracts - we call them a "User company" and an "SIer (System Integrator)". SIers often subcontract with other smaller software houses for work to be done. This subcontracting goes on recursively to make the contract chain sometimes as long as 5 or 6 hops. So "one team" can consist of 20 people, including one customer, one project manager (from the top SIer) and developers from all different software houses. In a situation like this, it becomes very difficult to share one goal across the team. The goal ideally has to be defined from the viewpoint of the ultimate customer, but because everybody belongs to each different company, their separate goals become to fulfill the Quality, Cost and Delivery commitments written into the contracts. Recently, this industry structure has started changing. Companies who deliver their services heavily via internet browsers and mobile phones, especially games (ex. GREE and DeNA)and multitenant web shopping malls(ex. 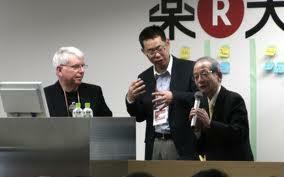 Rakuten) are hiring developers inside the company instead of outsourcing the systems to SIers. Over the past 2 years, a lot of skillful developers have moved (changed jobs) from SIers to these web service companies. I believe this is a good thing because this changes project teams to a one team structure where everyone belongs to the same company, sharing the customer’s viewpoint and goals, sharing the same KPIs. Once everybody on the team shares the same goal, we are very good at using tacit knowledge. Sorry if I’m biased, but to me, Western people are very good at separating science and art, creating explicit concept structures and applying them to the real world so to attack repetitious problems. You make "methodologies". Eastern people are not as good at formally expressing things, but we act and share ideas that worked at Gemba (a Toyota word for the workplace, not on the desk) locally. And we go often socialise after work almost like a family. As an agricultural people we have been working like this as a family for a long time, cerebrating harvest, sharing food, working together. Agile, when it started, looked like a group of iterative methodologies, but it actually is an attitude, a way of thinking in context and an ability to change yourself. 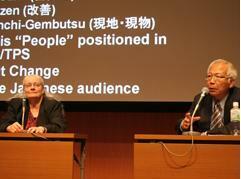 In that sense, I’d like to contend that we Japanese as a people are culturally good at Agile and now, our era has come! Annual Conference: "Agile Japan" and "Innovation Sprint"
Since 2009, we’ve run AgileJapan annual conferences to share such Gemba experiences to form trans-Gemba knowledge in Japan. The event consists of two keynotes, experience reports and workshops. Every year, we intentionally invite one Western and one Japanese keynote speakers. In 2009, Mary Poppendieck talked about the TPS (Toyota Production System) as the origin of Lean and ex-Toyota manager Satoshi Kuroiwa talked about Agile in the vocabulary of TPS. It was sensational to find how the Agile principles can be explained in TPS and a TPS Sensei (guru) was now a passionate practitioner of Agile (Satoshi Kuroiwa is coming to talk at Agile2011 by the way). 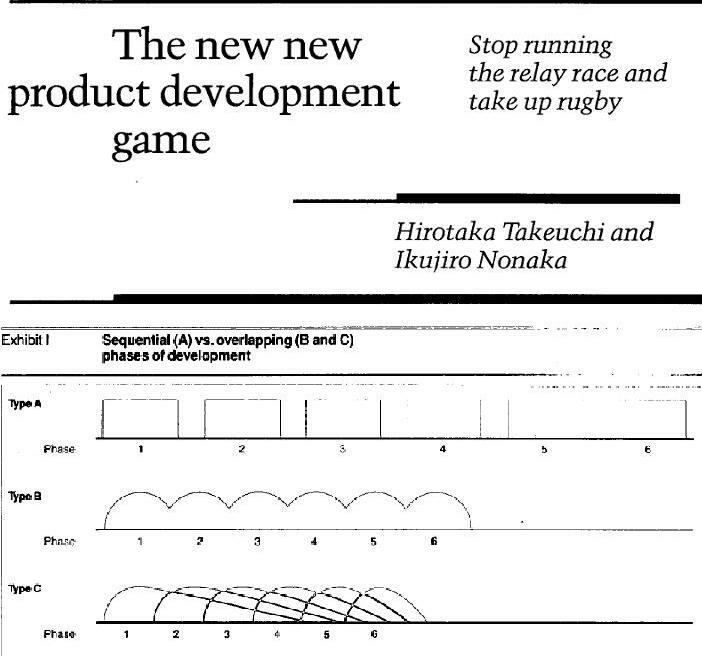 In 2010, Allan Shalloway talked about Post-Agile and Lean movement, and Ikujiro Nonaka(grandfather of Scrum) talked about the original Scrum and the role of leadership in it. Ikujiro Nonaka did not know anything about Agile at the time I asked him to speak, but he was so glad that his idea from over 20 years ago was revitalized in the software industry and he can talk about the famous SECI knowledge creation model (which I think models Agile as a learning cycle) again in front of software developers in Japan. In 2011, we invited Linda Rising as the keynoter for her awesome talk about "Fearless Change" just after the earthquake disaster. I reported on this talk in this article. There was another big event we held, "Innovation Sprint", in which we invited Jeff Sutherland and Ikujiro Nonaka as the two keynote speakers. 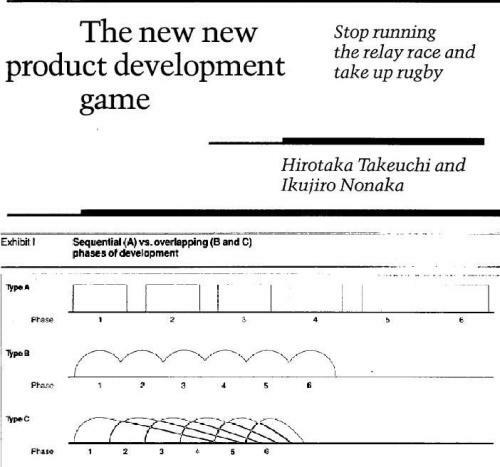 It is well-known that Jeff named his invention process "Scrum" because he was inspired by "The New New Product Development Games" written by Takeuchi and Nonaka (1986). At that event, Jeff showed his long time respect for Nonaka, and Nonaka appreciated Jeff’s great work in the software development context which Nonaka didn’t think of at all at the time he had coined the word Scrum. For further discussion, see my blog entry. Jeff Sutherland also blogged about this event here. I’m so proud of being involved in this phenomenal moment, when Eastern and Western thinking finally met in a collaborative way in Japan. As a developer in Japan who received a Gordon Pask Award, I reported the current changes happening in the Japan software industry. The industry environment is getting more and more exciting with the uptake of Agile approaches. Also, we are finding that the roots of Lean and Scrum concepts are inherently in us, they do not came alone from Western thinking. OK, now it is the time for us, friends! Kenji Hiranabe is CEO of Change Vision, Inc., an ISV of an Agile modeling tool astah, based in Tokyo Japan. His recent articles includes "Kanban Applied to Software Development: from Agile to Lean". He is a leader of the Japanese Agile community and has translated Agile books "Lean Software Development," "XP Installed", "Agile Project Management" into Japanese. Kenji is a 2008 Gordon Pask Award recipient for contributions to Agile practice. I just wanted to mention there's a new cover sheet for the TPS report, yeah... so... if you could just remember that next time... so yeah... OK.